3D water phantom for quick, intuitive commissioning and QA. Set-up is easy with complimentary, customized auto-queues and 24 x 7 support. The DoseView 3D is a 3-axis water scanning phantom that fuses robust hardware with easy-to-use software for superior beam commissioning and quality assurance measurements. Manufactured with a rigid, one-piece cast aluminum frame and stainless steel leadscrews. Three leveling screws are mounted above the scanning volume, making leveling easy even when the phantom is filled. Reduced detector cable length lessens settling time and opportunity for cable leakage. 5 stepper motors maintain superior precision over the phantom’s lifetime. An intuitive wireless pendant allows for easy vault operation without restricting movement. Cable carriers keep the motor connections compact and unobtrusive. Position holders horizontally or vertically while maintaining a consistent origin location using the Detector Alignment System. Customized auto-queue scan sets are implemented at no cost for each customer. This time-saving feature will save 8+ hours of work when setting up scans. Customers also have the flexibility of choosing wizard-based or manual setup options to define their own scans. Custom scans created in Auto-Acquisition mode can be saved and recalled for later testing. These sets can be implemented, edited and organized on a TPS or custom basis to streamline commissioning and QA procedures. Standard Imaging also provides 24 x 7 phone support for DV3D in USA. Wireless pendant with 0.1 mm fine positioning facilitates automated alignment. Quickly switch detectors without resetting isocenter/origin. Integrated hardware, convenient software and wireless communication means fewer cables and fast setup. Easy, repeatable tank positioning using the Precision Positioning Platform. Customized Auto-queue scan sets implemented at no cost for each customer. This time-saving feature will save you 8+ hours of work when setting up scans. Accelerate scan acquisition using low-noise, high-speed on-board electrometer. Rigid one piece cast aluminum frame ensures reliability and reproducibility in measurements. Intuitive wizard based software allows saved scan routines in auto acquisition mode. Comprehensive suite of data management and manipulation tools. Acquire profile depth and PDD data in the same sequence. Easily export scan data to TPS with all supported systems included. Setup is simple, fast and repeatable with the DoseView 3D. A wireless pendant and fiducials on the tank allow for quick coarse positioning, while the Precision Positioning Platform helps perform the final minute adjustments. Auto-fill capacity allows users to install detectors while the tank is filling. The Detector Alignment System ensures that the center of the detector is consistently placed at the exact position relative to the water’s surface. Begin data acquisition by using either the wizard-based or manual setup options to define custom scans, which can be saved and recalled for later testing. These sets can be implemented, edited and organized on a TPS or custom basis. The DoseView 3D acquires both depth dose and profile data in a single operation. All scan data is saved in real-time in case a beam needs to be shutoff. The Scan Processing Module in the DoseView 3D software features a suite of tools for data manipulation. All raw scan data is stored in the same file format as processed data for quick reference and comparison. Scan data is stored in machine -> energy -> SSD hierarchy for easy browsing and editing of existing files. Export scan data to a variety of treatment planning systems, including: Varian Eclipse, Phillips Pinnacle, CMS XiO, Nucletron™ Oncentra and Monaco. All supported TPS systems are included at no additional charge. "The DoseView 3D is an outstanding scanning tank. Setup is simple and easy. Hopefully you are only using your scanning tank once a year. DV3D has made the set up so simple that after 12 months of not using the tank it still feels familiar. The software guides you through step by step on initializing the tank and preparing it for scanning in case you have forgot all the steps since last use. With its three point leveling arm, fine tune position, and auto field centering, setup can be achieved in less than 20 minutes." "Having used other water Phantoms in the past, the DoseView 3D is by far the easiest and most robust scanner I've ever worked with. Intuitive setup, taking less than 20 minutes, the resulting scan data was clean, requiring minimal post processing. " “I really did like the distinct features of the DV3D. Take the water reservoir for example, compared to other water tanks where you have to bring the reservoir…. this now makes set up quick and easy." "We are using this water phantom every month for measurement, thanks to it being very easy to setup and use." Easily acquire depth-dose measurements in an intuitive, TG-51 and TRS-398 compliant 1D water scanning system. Publications, tech notes, testimonials, and other resources to support DoseView 3D. Does the software include the ability to generate PDD and TMR Tables? Yes. The Table Generation Module allows you to create and edit the following table types: PDD, TAR, TPR/TMR. Can DV3D acquire a 40x40 scan at 30 cm depth? Yes, the DV3D can acquire 40x40 scans at 30 cm depth by performing half scans. However, this is done while remaining at 100 SSD, instead of requiring a vertical shift to correctly account for head scatter. Performing scans at other SSDs may not be indicative of the true scatter conditions found at 100 SSD. The DoseView 3D arrives completely assembled ready to scan. Your personalized prebuilt scanning ques are already loaded on the computer. Simply level the tank and start scanning in less than 30 minutes. No need to run self-leveling software that requires another trip into the treatment room. This same step must be completed for any subsequent scans. 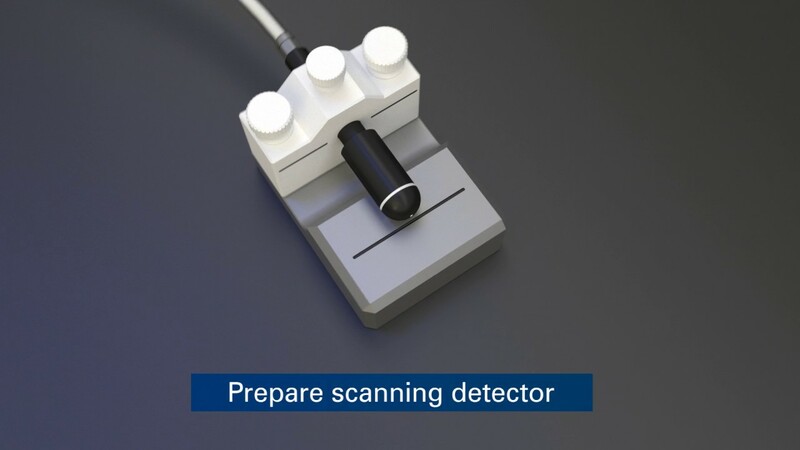 The DoseView 3D set up routine is simple to complete with aid from the detector alignment system which ensures that the center of the detector is consistently placed at the exact position relative to the water’s surface. One cable runs to the computer to finalize the setup. What type of database does DV3D use, and what is its capacity? DV3D data is stored in a flat file and folder based structure and storage is reliant upon the disc space of the computer. Because of this, it is highly unlikely to run out of capacity. The commissioning data of 2 photon energies with four wedges and 5 electron energies might result in 750 files, requiring about 3 MB of space. An 80 GB hard drive could store the data of over 25,000 commissionings! How is the DV3D different from other systems regarding processing? Both Raw and Processed data is saved separately, allowing easy viewing between scan data and preventing an accidental overwrite. Can the DV3D export my data directly to my treatment planning system? Yes, you can export directly to the following treatment planning systems: Varian Eclipse, Philips Pinnacle, Nucletron Oncentra, Elekta Monaco, XiO, Oncentra, Phillips Pinnacle, and Prowess Panther.